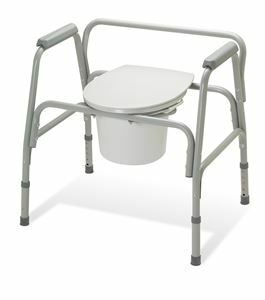 Ez-Care Xtra Wide Commode by Medline is used by those who have difficulties in walking to the bathroom. Especially designed for larger patients. Can be used on bedside or as a raised toilet seat in bathroom. The extra-wide base makes patient feel more comfortable when on it. Commode is made of strong frames so as in it can withhold larger patients. Comes with a splash guard, a pail and a lid. Can hold upto the weight of 200 kg.